הַשּׁוּבַּלִין שֶׁבַּקָּשִׁין וְשֶׁבַּשׁוּרוֹת הֲרֵי אֵילּוּ שֶׁל בַּעַל הַבַּיִת. אָמַר רַבִּי עֲקִיבָה בָּזוֹ נָהֲגוּ בַּעֲלֵי בָתִּים עַיִן יָפָה. The Tosefta states a new law regarding gifts to the poor. It is not clear if this Tosefta is related to any Mishna or not. It could be related to Mishna Peah 5:2, which discusses a single stalk of grain that was missed during the harvest. The reason this Tosefta is here is because it is related in its context to the two previous Toseftot, since they mentioned stubble and produce that is given away by the owner to the poor. It should be noted right away that due to the very vague language of the Tosefta there is a very wide variety of opinions regarding its explanation and the background of its case. I have explained this Tosefta according to what seemed to me was the most logical explanation based on agricultural practices and linguistic analysis of the text. It appears that this Tosefta argues on Mishna Peah 5:2 and concludes that a single standing stalk of grain belongs to the owner of the field, where as the Mishna says that it depends on the proximity of the lone stalk to the unharvested crops. The Mishna implies that if there are no crops left to harvest then obviously all lone standing stalks would belong to the poor. For a discussion of this Mishna see the commentary above on Tosefta Peah 2:16. It seems to me that the key difference between this Tosefta and the Tosefta Peah 2:16 is that there the stalk in discussion is detached and lying on the ground, which qualifies it for Leket, where as in this Tosefta the stalk is still attached to the ground and therefore does not qualify for Leket according to the Tosefta. Therefore there is no contradiction between the two Toseftot, although there is a contradiction with the Mishna Peah 5:2, since the Mishna is clearly talking about a standing stalk which is still attached to the ground. The word שּׁוּבַּל (Shubal) is a variation used in Palestinian Aramaic dialect of the Hebrew word שִׁיבּוֹלֶת (Shibolet) meaning “a stalk of grain”. See Marcus Jastrow, “Dictionary of the Targumim, Talmud Bavli, Yerushalmi and Midrashic Literature”, 2nd Edition, 1926, p. 1529, entry שובל. It is rather obvious that the Tosefta is referring to standing stalks which are still attached to the ground and not to fallen stalks that are detached, because if the stalks were fallen then they would qualify as standard Leket (fallen stalks) and would belong to the poor by Torah law. Also, since the word Shubal in its singular form is referring to a single stalk of grain, in its plural form, Shubalin, it is referring to many lone stalks of grain. It cannot mean a sheaf (i.e. a bundle of many stalks) of grain, as explained by Cheshek Shlomo, because the Hebrew word for a sheaf is אֲלוּמָּה (Aluma) and would have been used here if that is what the Tosefta was referring to. Also, the Tosefta cannot be referring to anything that qualifies to be Shikcha (forgotten sheaves) by Torah law, since Shikcha only refers to sheaves that have been bundled in order to be carried away from the field to a storage silo, and since in this case it cannot be referring to sheaves it also cannot be talking about Shikcha. Therefore it is only natural to conclude that since these lone free standing stalks do not qualify to be neither Leket nor Shikcha, they do not belong to the poor, but rather to the owner of the field. For other peculiar explanations of this Tosefta see Minchat Yitzchak and the commentary of the Raavad on Mishna Eduyot 2:4. The paths in a wheat field or any other crop field are not just there for convenience so that a person can walk through the field. They are necessary for increasing the yield of the crops. The technique of spacing out the crops is called Row Spacing. Often it is done together with another technique for clearing out the weeds from the crops called Inter Row Hoeing. It should be noted that the correct reading here is שׁוּרוֹת (Shurot), rows, as it is in the Erfurt manuscript. The reading in the Vienna manuscript is שָׂדוֹת (Sadot), fields, which does not make any sense, since everything we are talking about is located inside a field. The Tosefta needs to clarify that it makes no difference where these stalks are located in the field, because otherwise the poor may think that if these stalks are located among the stubble they might be considered Leket since it is something that the owner forgot to cutoff while he was harvesting, not realizing that Leket only applies to stalks that fell down from the farmer’s hands after they have been cutoff and not to stalks that have never been cutoff in the first place. If these lone standing stalks are located in the paths between the rows of cutoff grain then the poor might think that the owner did not even intend to plant them there and therefore they naturally can take them since it is something that grew by a fluke. Therefore the Tosefta teaches us that even stalks that grew out of their normal place still belong to the owner and cannot be taken by the poor. 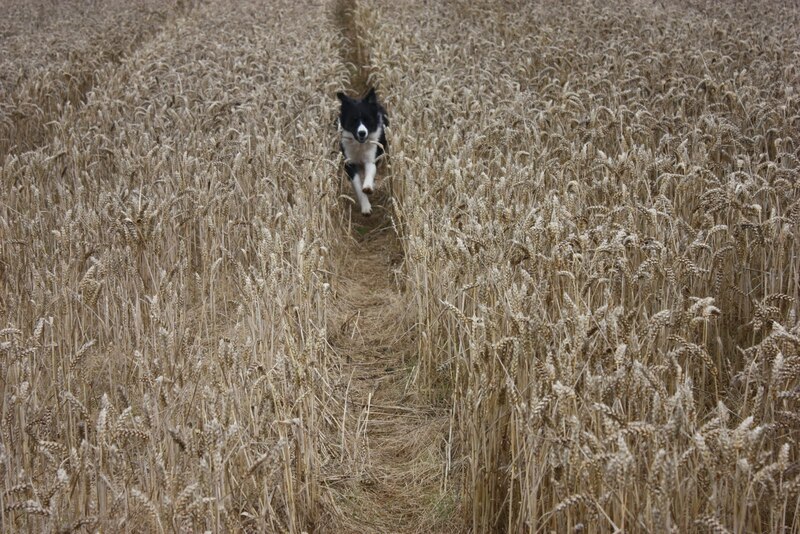 A dog running through a spacing path in a wheat field. Notice another spacing path in the left upper corner of the picture. Photo: crystaljigsaw.blogspot.com. Rebbi Akiva is not arguing on the statement of the Tanna Kama, but rather he is just pointing out that although these stalks rightfully belong to the owners, they allowed the poor to take them. I would assume that the amount of such stalks was relatively small, since the farmers were careful to harvest the crops without leaving too many standing stalks. This is in contrast to the wheat taken by ants mentioned earlier in Tosefta Peah 2:17 which amounted to a very substantial amount and therefore was kept by the owners of the fields. 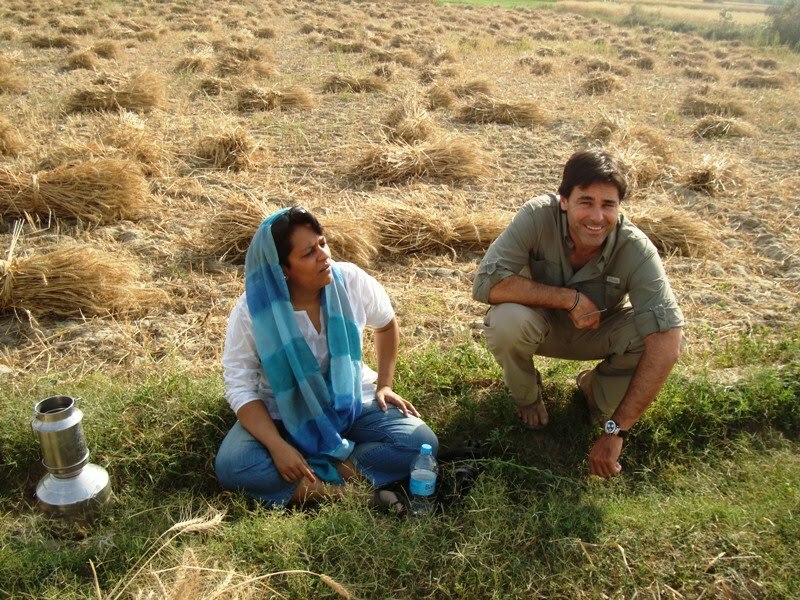 A wheat field harvested by hand with sickles in Rajasthan, India, in March 2010. Photo: www.yolike.com/india/ Notice that it does not seem like there are a lot of upright standing stalks of wheat left. I have been doing some searching around different catalogs for seforim on the Tosefta. The following is a list of books that I came up with that I was not aware of before. Some are new and some are old. If anyone can get a hold of the books that are not in copyright (published before 1940) please contact me support@toseftaonline.org. Der Tosephtatraktat Berakot : Text, Übersetzung und Erklärung / von Oscar Holtzmann. Giessen, A. Töpelmann, 1912. Authority and tradition : Toseftan baraitot in Talmudic Babylonia / by Yaakov Elman. New York : Michael Scharf Publication Trust of the Yeshiva University Press ; Hoboken, N.J. : Ktav, 1994. Aboda Zara : Mischna und Tosefta : übersetzt und mit vornehmlicher Berücksichtigung der Altertümer erklärt : Beilage zum Jahresberichte des Königl. Neuen Gymnasiums in Nürnberg für das Schuljahr 1915/16 / von Hans Blaufuss. Nürnberg : J.L. Stich, 1916. Der Tosephtatraktat Roš haššana in vokalisiertem Text mit sprachlichen Textkritischen und sachlichen Bemerkungen, von Paul Fiebig. Bonn, A. Marcus und E. Weber, 1914.